Discover the latest products and ideas from Syncro in our new catalogue, no. 20/2018. Browse here (above), download free of charge or call into your nearest installation centre to pick up a copy! 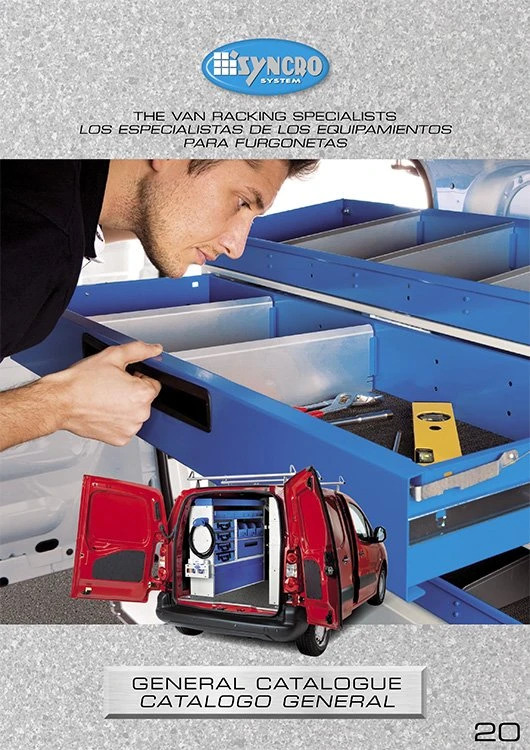 The 20th edition of Syncro’s van racking catalogue contains all the products introduced in recent months. Let’s have a closer look! 1. New floor liner surfaces. The yellow section dedicated to van body liners presents two new surfaces for plywood floor liners. Page 30 provides photos and details of the new marble-look surface that stands out for its bright finish, easy cleaning and good grip. Page 31 illustrates the new rice-grain rubber surface that is exceptionally resistant to wear and boasts the best grip available on the market today. 2. Metal cases with new hinges. The green section presents Syncro’s vast range of racking products, starting with cases. The new development illustrated on page 41 concerns the hinges now fitted to Syncro’s metal cases to stop lids opening too far and tipping cases over backwards. Page 130 in the green section describes a brand-new addition to the Syncro range: stainless steel trays, specially designed to transport liquid, oil and fuel canisters without spillage. The new trays are particularly easy to fit and remove for emptying. 4. Writing boards, work tops and vice benches with the new marble-look surface. You can see installations featuring the new marble-look finish on pages 59 (writing boards for drawers), 150 -151 (work surfaces) and 156 (pull-out vice benches). 5. New cable and hose reels. Page 182 in the fuchsia section, which focuses on accessories, provides a complete description of the cable and hose reels available from all Syncro System centres. The latest reels are equipped with Syncro’s exclusive Slow Motion system which limits rewinding speed to prevent the whiplash that can occur when a cable or hose is wound in too quickly. 6. New security locks: UFO 3. Page 186 is dedicated to Syncro System’s new security locks. The UFO 3 Comfort and UFO 3 Smart Duo models combine a superior level of safety with a choice of functions to suit different requirements. The new catalogue is arranged in the same way as the previous edition: there are still seven sections identified by different colours in the table of contents and on the sides of the pages to make finding content quick and easy. The background colour of the cover is still grey, but the aluminium tread plate design of issue 19 has been replaced by the new marble-look surface available as an option for floor liners and as standard for work surfaces, vice benches and writing boards. If you would like your own personal copy of catalogue no. 20 /2018, just call into your nearest Syncro racking centre: You can find a list of centres and dealers here.